Never discuss politics or religion, with anyone. No one is safe—not your neighbor, not your best friend, not even your mother. Differences in opinion can sour a relationship in an instant, and once hurtful accusations materialize, they linger in our minds. We can never look at that person the same again; the connection we had is altered, and in an attempt to avoid the uncomfortable, we avoid the person all together. You know what I’m talking about; everyone has that one relative or friend with whom they can never discuss such topics. Worse, our whole perspective of that person changes, and instead of being a unique individual that we should love, we look at that person as a foe, someone on the “other side”. Through our individual biases, we’ve allowed the septic polarization of politics, race, religion, or other sensitive issues poison our relationships and stunt our personal growth. To understand partiality and prejudice, we must first look to learning. From birth, the human brain is in a constant state of attempting to understand its environment. Through events, it constructs meaning, and this built-in memory becomes a springboard from which we evaluate other events. For instance, if we eat a whole jar of olives in one sitting and get violently ill, we tend to react in a repulsed manner during all future olive encounters. On the other hand, we could love olives, because our favorite grandmother loved them, and sharing them with her is a memory we cherish. While this example is a simple one, it points to the very root of bias. We receive input—books, teachers, parents, music, etc.—and we make a judgment. That judgment then becomes our worldview. · Confirmation bias describes our dispensation toward sources that support our opinions and disregard for those that negate them. Ultimately, we want to feel secure; therefore, we strive to prove ourselves and avoid uncomfortable self-doubt (B.F. Skinner identified this behavior as cognitive dissonance). · Ingroup bias is the phenomenon that explains how humans unconditionally support their own kind and reject outsiders. Researchers believe that oxytocin, a chemical in the brain that makes us feel good (otherwise known as the “love molecule”), makes us defend and believe our own group’s values more earnestly. On the other hand, it is this same chemical that may make us vehemently snub anyone who is outside this group. · Status-quo bias illustrates how infrequent humans change their perspectives. We typically believe that our way of thinking is right and that if the opposite happens, terrible events will occur. This bias is present in the United States’ current political climate. Many assume that the other party is wrong, and so, no progress can happen because of an infinite stalemate. · Projection bias happens because we humans are egotistical and can’t imagine that another viewpoint exists beyond our own. We are limited to our own experiences and constructs; therefore, we automatically assume that our way is the right way. 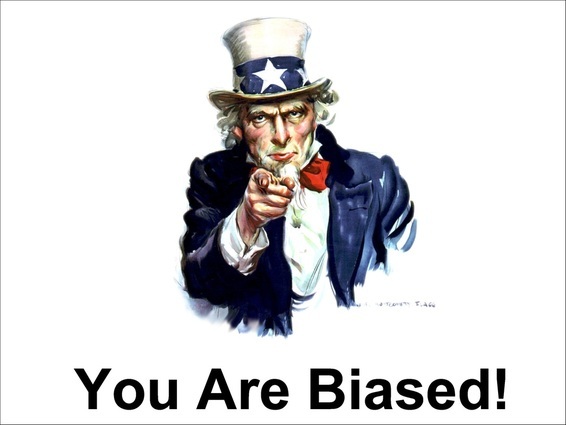 Other types of cognitive biases exist that cause us to remain partial on an individual level (negativity bias of the media that feeds our fears or bandwagon effect that makes us act on behalf of popular beliefs). However, for the sake of individual insight and development, we must take responsibility for our own biases. It is simply not enough to avoid conversations about important issues. Censorship has never improved anyone. Mature and open dialogue about religion, politics, and racism can only work toward solutions and evolution. When we close our mouths, we can close our minds. We need to take individual steps to recognize bias, embrace our differences, and accept other viewpoints. The ultimate goal of life should be to continue to grow; what kind of growth can occur if we’ve established that we already know what’s right? Step 1: Acknowledge that you have biases. Every time you see people, you make a judgment. Every time you read words, you make an assessment. Every time you people speak, you evaluate their credibility based on your partiality. Try to remain conscious of this personal aspect. What are you missing because of your biases? What have you failed to learn? What unique insight does someone else have to offer that you’ve neglected? Take responsibility for your growth. Step 2: Treat others with dignity. Once you begin to acknowledge your personal biases, you will recognize that other people have their own ideals and personal beliefs. Just as you think your perspectives have value, so do others. You want to persuade others to believe what you do, and so do others. If you give people your attention and time, they will, too (hopefully). It is through these respectful encounters that positive change occurs. Progress cannot be made without compromise. Step 3: Mind your reactions. Humans are reactionary. It is very difficult to think before we act. But to ensure that we respect others and that we have not missed out on a nugget of wisdom, we must breathe before we speak. What has the person said that you can agree on? How would you feel if you were someone else with a different life’s circumstance? What piece of information can you assimilate into your current value system to improve upon your life and logic? Don’t fall prey to propaganda and hate. Strive to be unique and self-made. Don’t let others make up your mind; make it up yourself. Create blended ideas and come from a holistic perspective. Always see the other side. After much consideration, reject what is harmful and embrace what is right. Be mindful and be humble. Always learn.